“Quel ramo del Lago di Como che volge a mezzogiorno….” (Lit. That part of the Lake Como facing south..) …. this is where our journey begins. 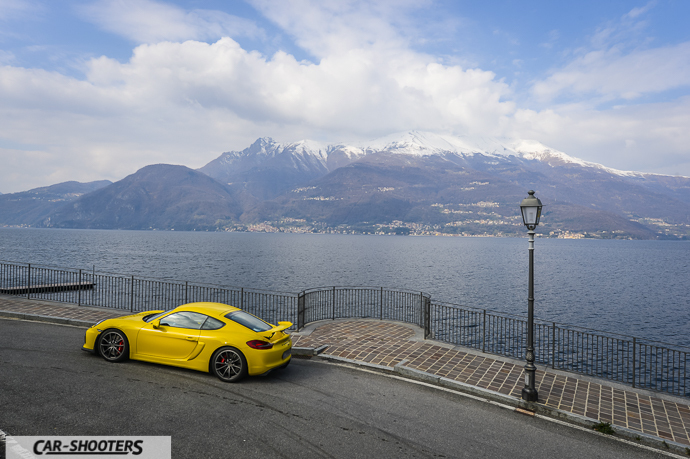 Lake Como is perfect for a driving day on fantastic roads surrounded by a rich in history landscape. 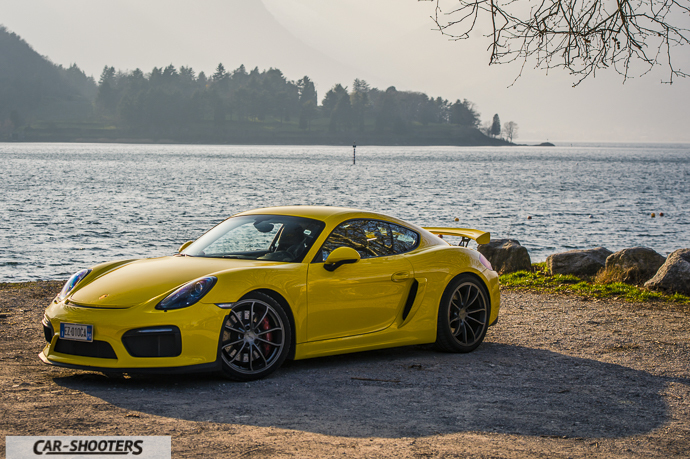 Special guest of this outing around the lake is the fantastic Porsche Cayman GT4 (Take a look at our review here), which, on these streets, will prove if a car born for the track is suitable or not even on the everyday roads. Surely this car impresses fot the space dedicated to luggage, thinking about a Porsche fitted with rollbar, front splitter and big rear spoiler, is not so obvious to imagine it carrying 3 trolley and two backpacks. Our route begins on the road 36 of Lake Como and Spluga that we abandon at Abbadia Lariana, after Lecco, taking the SP72 that will accompany us throughout the east side of Lake Como. From Abbadia Lariana the wonderful view of the lake will be the perfect backdrop for the villages we will see during our trip. The first of these is Mandello del Lario, famous for Moto Guzzi, with the historic factory and museum. 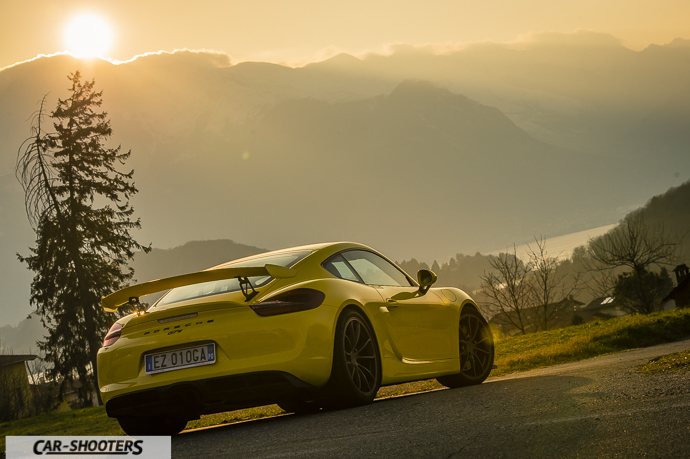 Continuing on, the road becomes more and more scenic, with tunnels into the rough rock where it is impossible not to pull down the windows, downshifting, and let roar the great boxer 3.8-liter delivering 385HP. A real monster! 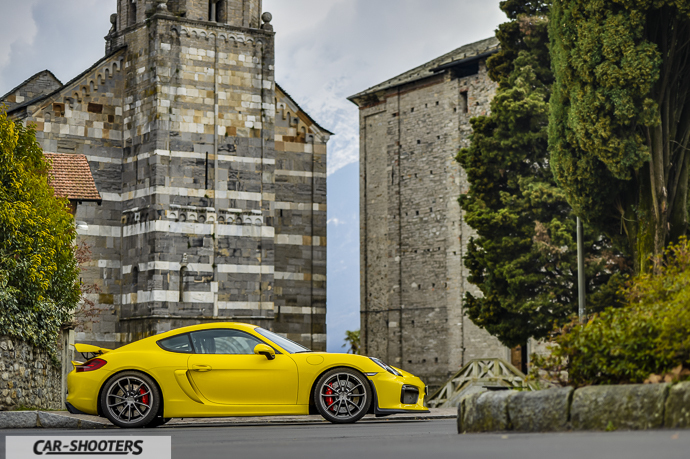 We allow ourselves a break in Varenna, being very careful to avoid the covered parking with very steep ramps, enemy of our Porsche. Varenna is one of the best preserved medieval towns in Lake Como and an important hub of inland navigation with many tourist facilities. Walking around this village will take you to discover an another era atmosphere, with a breath-taking view. 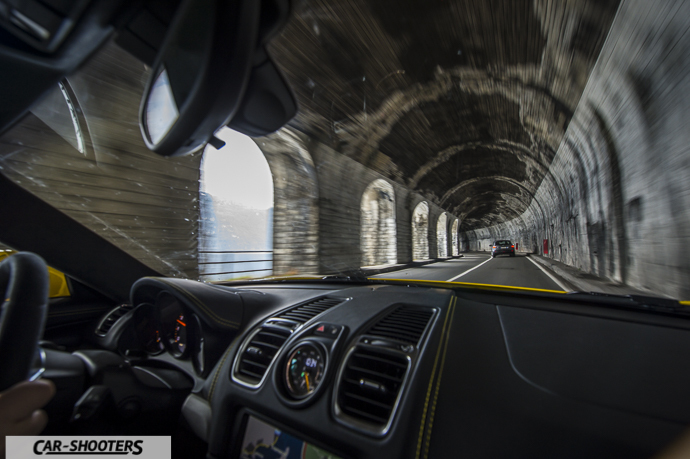 After Varenna the road becomes tortuous and enjoyable to drive. 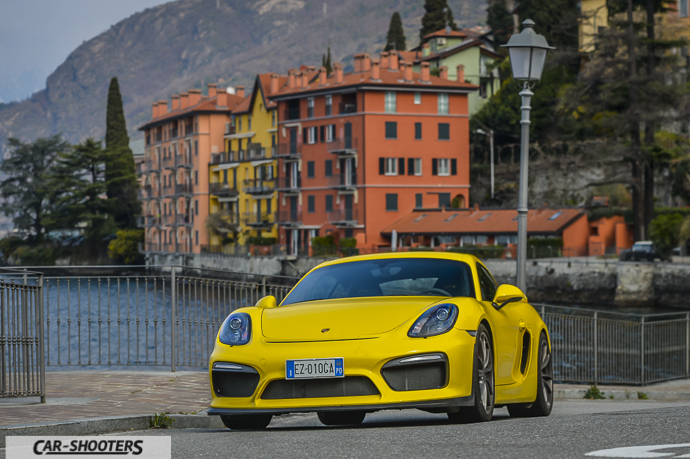 With the Porsche Cayman GT4 you can feel every unevenness of the road and the perfect chassis and the brutal engine give you an amazing power and control feeling. I’m driving a car totally extreme. 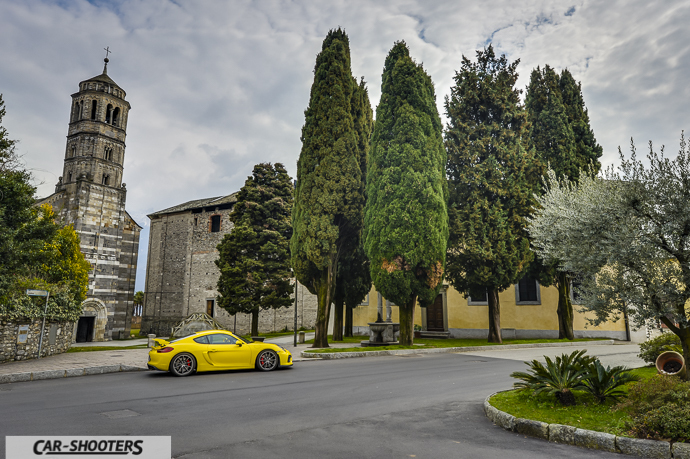 The line and the bright yellow color certainly do not pass unnoticed in the small villages of the Lecco’s side of Lake Como. Nor did his sound, with a set up made for racing, characterized by a carbon shell seats and the manual transmission with a clutch really “tough” to press. 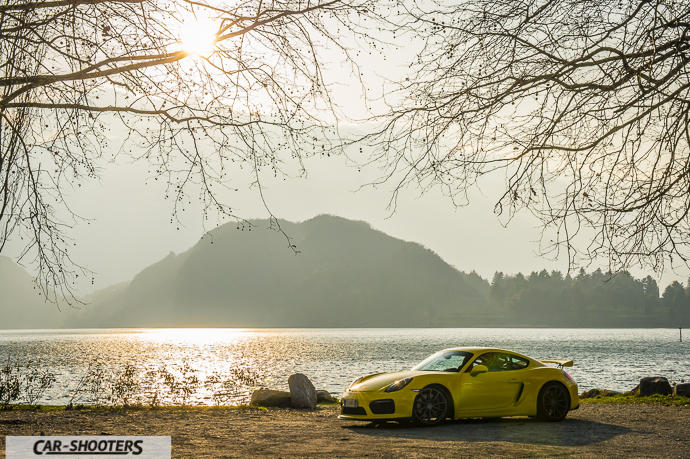 We pass the towns of Bellano and Piona, where you can stop for a picnic on the shore of the lake and where we stop for some shots taking advantage of the sun and to breathe this lovely fresh air. Soon we should turn in the direction of Como in the northernmost tip of the lake. Our descent to Como takes us to go from Gravedona, surely one of the most important town of upper Lake Como. 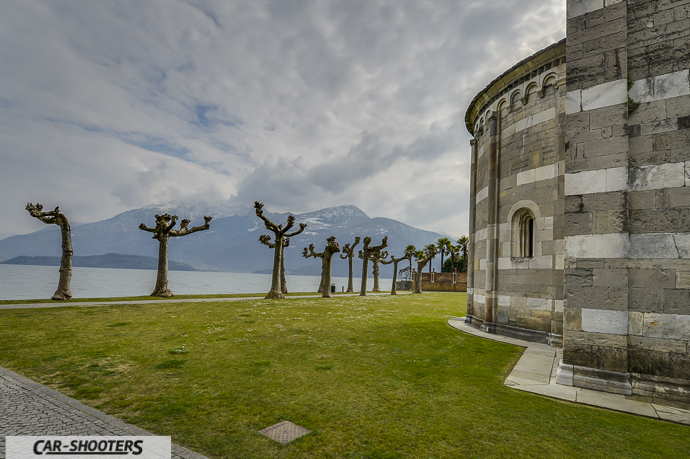 Here we find a real medieval treasure, the church of Santa Maria del Tiglio that faces directly on the Lake Como. 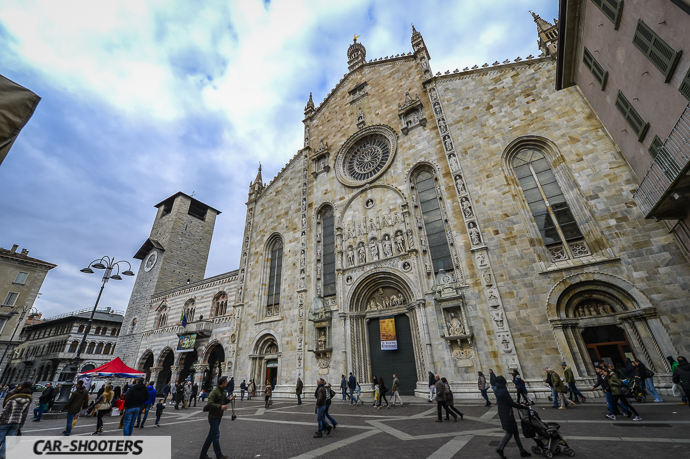 The church is from the Romanesque Como, dated in the second half of the twelfth century and lies on the former baptistery of the fifth century dedicated to St. John the Baptist. It’s a very special place for sure, perfect for taking some pictures. 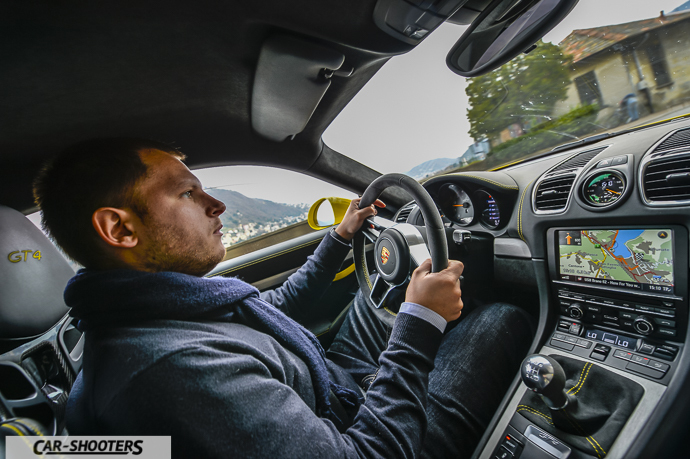 Continuing along the SS340 Como, we feel more and more comfortable driving the Porsche Cayman GT4. 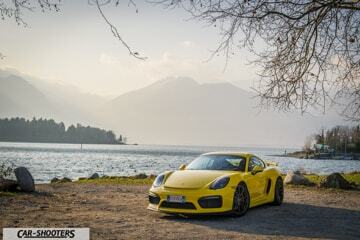 The closer we get to Cernobbio and Como and the easier is to see cars similar to our German one or even better like a beautiful Porsche 911 GT3 RS in gray color, I love that car. Even the houses are more elegant, such as the famous Villa Camilla and the famous Villa Carlotta … Wait, but that was perhaps George Clooney? 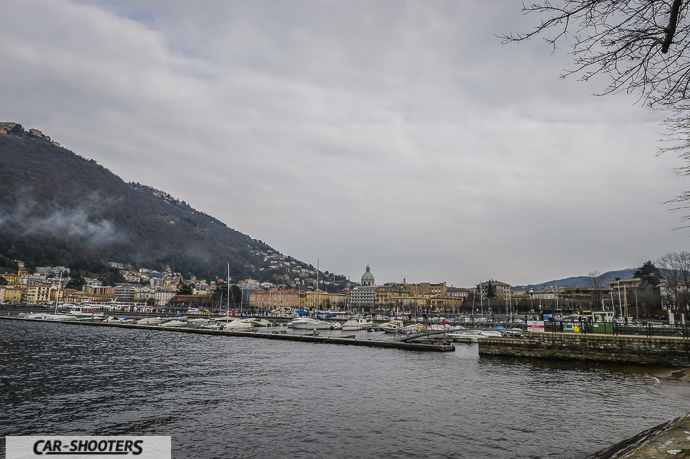 We take advantage of the last hours of the afternoon to give us a walk in the center of Como before ending our tour. We start from the dock, with the monument dedicated to Alessandro Volta called Electric Life and then head towards to city centre. 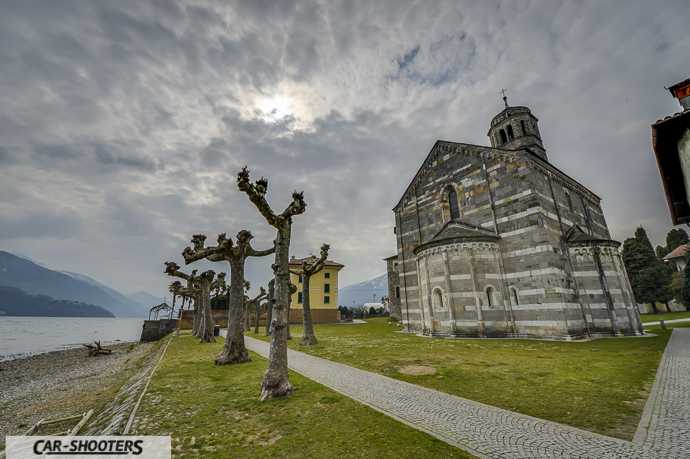 The Como Cathedral, built more than four hundred years ago, is a perfect example of the skill of the Como’s craftsmen. This one is still one of the best examples of Late Gothic architecture in northern Italy. 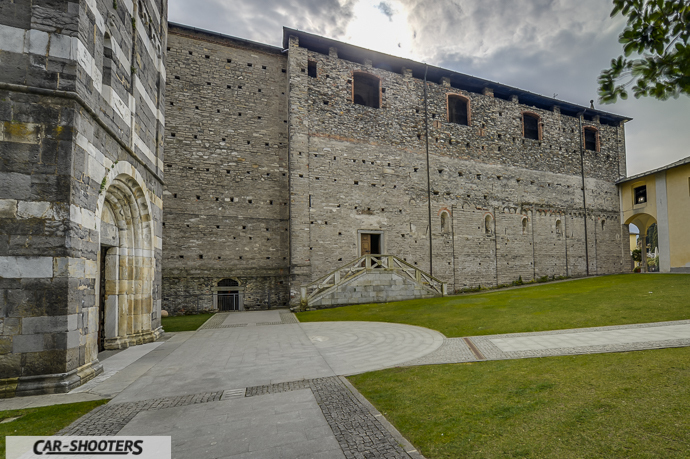 Continuing the tour of the city, we recommend a visit to the medieval city gate. 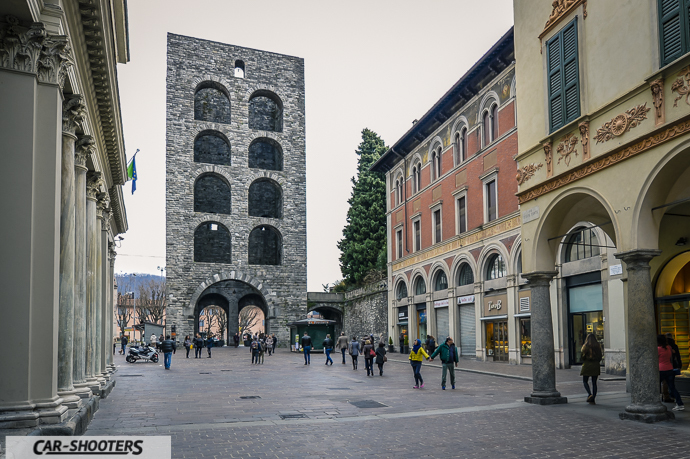 Built in 1192, Porta Torre is the most visible evidence of the medieval walls. After a cup of tea in a restaurant in the city centre, it is time to complete our tour of the lake. Surely this beautiful place is worth a real holiday in order to discover all the beauty of Como Lake. 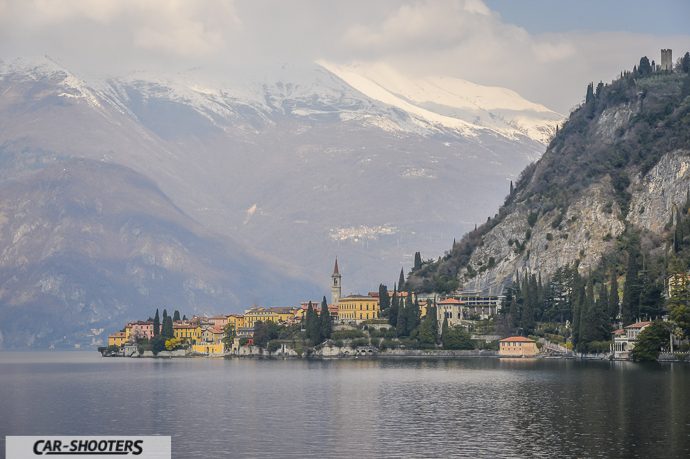 Other towns such as Bellagio and the city of Lecco, famous for being one of the locations of the Manzoni’s “Promessi sposi” woth a visit for sure. We end this route, with an average consumption of 9 km/l. Not bad at all. 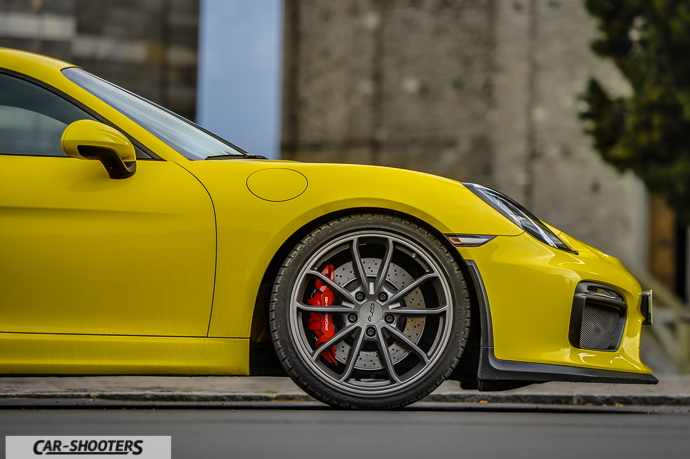 We must pay special attention to the more pronounced bumps and potholes, as well as to the ramps of the parking lots (remembering that this car is not made for this situations) but overall this Porsche Cayman GT4 is a car that satisfies, engages and entertains in every aspect, and after a day of driving there is no better phrase to say thank “tired but happy”!